This article is about the video game. For other uses, see Pac-Man (disambiguation). Pac-Man[a] (stylized in all caps) is an arcade game designed by Toru Iwatani and published by Namco and Midway Games. It was initally released in Japan as PUCKMAN in May 1980, followed by the United States in October of the same year. At the time of the game's release, the most popular arcade games were space shooters, such as Space Invaders, Galaxian, and Asteroids, with the most noticeable difference being racing games and derivatives of Pong. Pac-Man received a lukewarm response from critics initially, but has retrospectively been regarded as one of the greatest and most influential video games of all time. It is credited with establishing conventions of the maze chase genre, spawning numerous clones and bootlegs, and has since become a social phenomenon and an icon of 1980s popular culture. Pac-Man is one of the highest-grossing video games of all time, having generated more than $2.5 billion in quarters by 1990. Adjusted for inflation, all versions of the game have earned an estimated $12 billion in revenue. The success of Pac-Man led to numerous spin-offs, including more than 30 officially licensed ones, as well as several bootleg versions, as well as an animated TV series in 1982 and the top-ten single "Pac-Man Fever" (1981) by Buckner and Garcia. It is one of the longest-running video game franchises from the golden age of arcade games, and was later included in the Smithsonian Institution in Washington, D.C. and the Museum of Modern Art in New York. According to the Davie-Brown Index, the titular character has the highest brand awareness of any video games character among American consumers, with 94% recognition. The objective of the game is to accumulate as many points as possible by collecting dots, fruits, and eating blue ghosts, while normally avoiding the four ghosts. When all of the dots in a stage are eaten, that stage is completed, and the player will advance to the next one. Between some stages, one of three intermission animations plays. The four ghosts roam the maze and chase Pac-Man. If any of the ghosts touches Pac-Man, a life is lost. When all lives have been lost, the game is over. The player begins with three lives, but DIP switches in the machine can change the number of starting lives to one, two, or five. The player will receive one extra life bonus after obtaining 10,000 points. The number of points needed for a bonus life can be changed to 15,000 or 20,000, or disabled altogether. 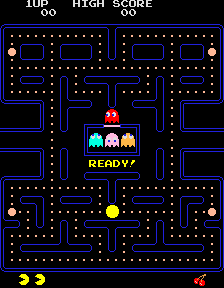 Near the corners of the maze are four flashing Power Pellets that provide Pac-Man with a temporary ability to eat the ghosts and earn bonus points that way. The enemies turn deep blue, reverse direction and move away from Pac-Man, and usually move more slowly. When an enemy is eaten, its eyes remain and return to the center ghost box where the ghost is regenerated in its normal color. The bonus score earned for eating a blue ghost increases exponentially for each consecutive ghost eaten while a single Power Pellet is active: a score of 100 points is scored for eating one ghost, 200 for eating a second ghost, 400 for a third, and 800 for the fourth. This cycle restarts from 100 points when Pac-Man eats the next Power Pellet. Blue enemies flash white to signal that they are about to return to their normal color and become dangerous again, and the length of time the enemies remain vulnerable varies from one stage to the next, generally becoming shorter as the game progresses. In later stages, the enemies go straight to flashing after a Power Pellet is consumed, bypassing blue, which means that they can only be eaten for a short amount of time, although they still reverse direction when a Power Pellet is eaten. Starting at stage nineteen, the ghosts do not become edible at all, but they still reverse direction. The enemies in Pac-Man are known variously as "monsters" or "ghosts". In an interview, creator Toru Iwatani stated that he designed each enemy with its own distinct personality to keep the game from becoming impossibly difficult or boring to play. Iwatani described the enemy behaviors in more detail at the 2011 Game Developers Conference. He stated that the red enemy simply chases Pac-Man, while the pink enemy aims for a position in front of Pac-Man's mouth. The blue enemy is "fickle" and sometimes heads toward Pac-Man, and other times away. Although he claimed that the orange enemy's behavior is random, in actuality it alternates from (a) behaving like the red enemy (when at some distance from Pac-Man) and (b) aiming towards the lower-left corner of the maze (whenever it gets too close to him). Pac-Man was designed to have no ending; as long as at least one life is left, the game was intended to continue indefinitely. However, at level 256, a bug corrupts the entire right half of the maze with seemingly random symbols and tiles, overwriting the values of edible dots, which makes it impossible to eat enough dots to beat the level, making it the de facto ultimate level, known in the culture as "the split screen". The bug is caused by the calculation of the number of fruit to draw rolling over to zero. The code attempts to draw 256 fruit–236 more than it was designed for–resulting in the maze being corrupted. The tile map that holds the fruits are 20 elements long and are arranged into three cases. Case A handles levels less than seven. Case B handles levels 8-19 and Case C handles level 19 and above. When the game reaches level 256, the level counter overflows back to 0 and thus, level 256 is treated as level 0. The game executes Case A rather than Case C because the level number is less than seven. The algorithm that draws the fruits continues to draw fruit till the fruit number and the level number match. Upon reaching fruit number 255, the fruit number overflows back to 0 (matching the level number) and 256 "fruit" have been drawn. The game draws the first 13 fruit with no issues, but upon reaching fruit number 14, fruit begin to be drawn on the right side of the map. Once the game reaches the 20th entry in the fruit table, the game can no longer draw any more fruit, but there is still 236 fruit it needs to draw and thus, the game begins to draw pieces of the tile map onto the screen to substitute the 236 extra fruit. Most of the pieces are free to move over, though some of them act like walls. Once all 256 fruit are drawn, the game draws 7 extra blank spaces after the final fruit. [clarification needed] The level is impossible to beat using only one game, as the player needs to eat 244 pellets to move to the next level. Most of the pellets have been overwritten by the tile map. There are nine pellets hidden within the glitch screen that re-spawn when you die, but with a maximum of five extra lives, this limits the number of pellets to 168. It is possible to beat the screen by using the "continue" button to eat the re-spawned pellets till the level is beaten. Once level "0" is beaten, the player is put back in level 1, with the ghost's difficulty set very high (thus no Ghost Blue Time). A perfect Pac-Man game is when the player achieves the maximum possible score on the first 255 levels by eating every possible dot, power pellet, fruit, and enemy, without losing a single life, and using all extra lives to score as many points as possible on level 256. The first person credited with achieving this score (3,333,360 points) was eSports player Billy Mitchell, who claimed to perform the feat in about six hours in 1999. But, in April 2018, video game ranker Twin Galaxies removed all of Mitchell's scores from their database after ruling certain Donkey Kong submissions were not achieved using original arcade hardware. Since Mitchell's Pac-Man achievement, as of 2019, 7 other players have attained the maximum score on an original arcade unit. The world record, according to Twin Galaxies, is currently held by David Race, with the fastest completion time of 3 hours, 28 minutes, and 49 seconds for the maximum possible score of 3,333,360 points. Historically, in December 1982, an eight-year-old boy, Jeffrey R. Yee, received a letter from U.S. President Ronald Reagan congratulating him on a worldwide record of 6,131,940 points, a score only possible if he had passed level 256. In September 1983, Walter Day, chief scorekeeper at Twin Galaxies, took the US National Video Game Team on a tour of the East Coast to visit video game players who said they could get through level 256. No video game player could demonstrate this ability. In 1999, Billy Mitchell had offered $100,000 to anyone who could complete level 256 before January 1, 2000; the prize expired unclaimed. Up into the early 1970s, Namco primarily specialized in kiddie rides for Japanese department stores. Masaya Nakamura, the founder of Namco, started to direct the company toward arcade games, starting with electromechanical ones such as F-1 (1976). He later hired a number of software engineers to develop their own video games so as to compete with companies like Atari, Inc.
Pac-Man was one of the first games developed by this new department within Namco. The game was developed primarily by a young 24-year-old employee named Toru Iwatani over a year, beginning in April 1979, employing a nine-man team. It was based on the concept of eating, and the original Japanese title is Pakkuman (パックマン), inspired by the Japanese onomatopoeic phrase paku-paku taberu (パクパク食べる), where paku-paku describes (the sound of) the mouth movement when widely opened and closed in succession. Although Iwatani has repeatedly stated that the character's shape was inspired by a pizza missing a slice, in a 1986 interview he admitted that this was a half-truth and the character design also came from simplifying and rounding out the Kanji character for mouth, kuchi (口). Iwatani attempted to appeal to a wider audience—beyond the typical demographics of young boys and teenagers. His intention was to attract girls to arcades because he found there were very few games that were played by women at the time. This led him to add elements of a maze, as well as cute ghost-like enemy characters. Eating to gain power, Iwatani has said, was a concept he borrowed from Popeye. The result was a game he named PUCKMAN as a reference to the main character's hockey puck shape. Later, in 1980, the game was picked up for manufacture in the United States by the Bally division Midway, which changed the game's name from PUCKMAN to Pac-Man in an effort to avoid vandalism from people changing the letter 'P' into an 'F' to spell out the F-word. The cabinet artwork was also changed for Western markets. When first launched in Japan by Namco in 1980, Pac-Man received a lukewarm response as Space Invaders and other similar games were more popular at the time. However, the game's success in North America in the same year took competitors and distributors by surprise. A frequently-repeated story claims that marketing executives saw Pac-Man at a trade show before its release and completely overlooked both it and the now-classic Defender, seeing a racing game called Rally-X (which also involves collecting items in a maze) as the game to outdo that year. However, industry reporting from that era indicates that it was Namco itself which was heavily promoting Rally-X at the 1980 Amusement & Music Operators Association, where Pac-Man was at least as well received and reviewed as Rally-X. Pac-Man quickly became more popular than anything seen in the video game industry. The game was estimated to have had 30 million active players across the United States in 1982. In a 1983 interview, Nakamura said that though he did expect Pac-Man to be successful, "I never thought it would be this big." It overtook Asteroids as the best-selling arcade game in North America, grossing over US$1 billion in quarters within a year, surpassing the highest-grossing film of the time, Star Wars. Arcade machines retailed at around $2400 each and sales totaled around $1 billion (equivalent to $2.61 billion in 2018), within 18 months of release. By 1982, 400,000 arcade machines had been sold worldwide, and an estimated 7 billion coins had been inserted into them. The combined sales of counterfeit arcade machines was nearly as high as the original. United States revenues from Pac-Man licensed games and products exceeded $1 billion. Toward the end of the 20th century, the arcade game's total gross consumer revenue had been estimated by Twin Galaxies at more than 10 billion quarters ($2.5 billion), making it the highest-grossing video game of all time, beating out Space Invaders. In 2016, USgamer calculated that the machines' inflation-adjusted takings were equivalent to $7.68 billion. Pac-Man was awarded "Best Commercial Arcade Game" at the 1981 Arcade Awards. II Computing listed the Atarisoft port tenth on the magazine's list of top Apple II games as of late 1985, based on sales and market-share data. In 2001, Pac-Man was voted the greatest video game of all time by a Dixons poll in the UK. The game of Pac-Man is regarded as one of the most influential video games of all time; its title character was the first original gaming mascot, the game established the maze chase game genre, it demonstrated the potential of characters in video games, it increased the appeal of video games with female audiences, and it was gaming's first broad licensing success. It was the first video game with power-ups, and the individual ghosts have deterministic artificial intelligence (AI) that reacts to player actions. It is often cited as the first game with cutscenes (in the form of brief comical interludes about Pac-Man and Blinky chasing each other),:2 though actually Space Invaders Part II employed a similar style of between-level intermissions in 1979. "Maze chase" games exploded on home computers after the release of Pac-Man. Some of them appeared before official ports, and garnered more attention from consumers, and sometimes lawyers, as a result. These include Taxman (1981) and Snack Attack (1982) for the Apple II, Jawbreaker (1981) and Ghost Hunter (1981) for the Atari 8-bit family, Scarfman (1981) for the TRS-80, and K.C. Munchkin! (1981) for the Odyssey². Pac-Man also inspired 3D variants of the concept, such as Monster Maze (1982), Spectre (1982), and early first-person shooters such as MIDI Maze (1987; which also had similar character designs). :5 John Romero credited Pac-Man as the game that had the biggest influence on his career; Wolfenstein 3D includes a Pac-Man level from a first-person perspective. Many post-Pac-Man titles include power-ups that briefly turn the tables on the enemy. The game's artificial intelligence inspired programmers who later worked for companies like Bethesda. Atari, Inc. licensed the home rights and developed versions of Pac-Man for their Atari 2600, Atari 8-bit family, and Atari 5200 systems. Ports to other systems were published under the Atarisoft label: Apple II, Commodore 64, VIC-20, Intellivision, IBM PC, Texas Instruments TI-99/4A, and ZX Spectrum. One of the first ports was the March 1982 release of the much-maligned port for the Atari 2600, which only somewhat resembles the original and was widely criticized for its flickering ghosts, and several design and implementation choices. Despite the criticism, this version of Pac-Man sold seven million units at $37.95 per copy, becoming the best-selling game of all time on the console. While enjoying initial sales success, Atari overestimated demand by producing 12 million cartridges, of which 5 million went unsold. Richard A. Edwards reviewed the Atari 2600 version in The Space Gamer No. 53. 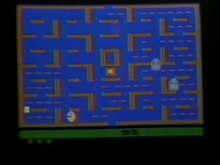 Edwards commented that "If you must have Pac-Man for your home, then this is it, but if you're hesitant, there are enough differences in this version to suggest passing it by." The port's poor quality damaged the company's reputation among consumers and retailers, becoming a contributing factor, alongside Atari's E.T. the Extra-Terrestrial, to Atari, Inc.'s decline and the North American video game crash of 1983. Namco later produced versions for the Nintendo Entertainment System, Game Boy, Game Boy Color, Game Gear, and Neo Geo Pocket Color. Namco ported the game to the Famicom in 1985, but, as they had no North American operations at this time, they had to license Atari—under the Tengen name—to release certain Namco Famicom titles for US audiences. The Atari release of Pac-Man was initially a licensed Nintendo cartridge in a standard gray shell, but soon afterwards Atari began manufacturing unauthorized clones of the NES lockout chip and produced unlicensed NES cartridges in black shells, including Pac-Man. Nintendo eventually discovered this ruse and filed a lawsuit against Atari. In 1993, Namco released Pac-Man for the NES themselves, thus there are three different North American releases of the NES Pac-Man—the Atari gray cartridge, the Atari black cartridge, and the Namco version—differing only in the copyright notices on the title screen. Guinness World Records has awarded the Pac-Man series eight records in Guinness World Records: Gamer's Edition 2008, including First Perfect Pac-Man Game for Billy Mitchell's July 3, 1999 score and "Most Successful Coin-Operated Game". On June 3, 2010, at the NLGD Festival of Games, the game's creator Toru Iwatani officially received the certificate from Guinness World Records for Pac-Man having had the most "coin-operated arcade machines" installed worldwide: 293,822. The record was set and recognized in 2005 and mentioned in the Guinness World Records: Gamer's Edition 2008, but finally actually awarded in 2010. The Pac-Man character and game series became an icon of video game culture during the 1980s, and a wide variety of Pac-Man merchandise has been marketed with the character's image, from t-shirts and toys to hand-held video game imitations and even specially shaped pasta. General Mills manufactured a cereal by the Pac-Man name in 1983. The game has inspired various real-life recreations, involving either real people or robots. One event called Pac-Manhattan set a Guinness World Record for "Largest Pac-Man Game" in 2004. The business term "Pac-Man defense" in mergers and acquisitions refers to a hostile takeover target that attempts to reverse the situation and take over its would-be acquirer instead, a reference to Pac-Man's power pellets. The game's popularity has led to "Pac-Man" being adopted as a nickname, most notably by boxer Manny Pacquiao, as well as the American football player Adam Jones. On August 21, 2016, in the 2016 Summer Olympics closing ceremony, during a video which showcased Tokyo as the host of the 2020 Summer Olympics, a small segment shows Pac-Man and the ghosts racing against each other eating dots on a running track. The Pac-Man animated TV series produced by Hanna–Barbera aired on ABC from 1982 to 1983. A computer-generated animated series titled Pac-Man and the Ghostly Adventures aired on Disney XD in June 2013. As of February 2019, the series was also planned to air on Universal Kids, but it was ultimately cancelled due to low coverage of NBCUniversal. In music, the Buckner & Garcia song "Pac-Man Fever" (1981) went to No. 9 on the Billboard Hot 100 charts, and received a Gold certification for over a million records sold by 1982, and a total of 2.5 million copies sold as of 2008. Their Pac-Man Fever album (1982) also sold over a million copies. In 1982 "Weird Al" Yankovic recorded a parody of "Taxman" by the Beatles as "Pac-Man." It was eventually released in 2017 as part of Squeeze Box: The Complete Works of "Weird Al" Yankovic. In 1992, Aphex Twin (under the name Power-Pill) released Pac-Man, a techno album which consists mostly of samples from the game. In 2008, a feature film based on the game was in development. The Pac-Man character appears in the film Pixels (2015), with Denis Akiyama playing series creator Toru Iwatani. Pac-Man is referenced and makes an appearance in the 2017 film Guardians of the Galaxy 2. In Sword Art Online The Movie: Ordinal Scale where Kirito and his friends beat a VR Pac-Man game called PAC-Man 2024. Iwatani makes a cameo at the beginning of the film as an arcade technician. In the Japanese tokusatsu film Kamen Rider Heisei Generations: Dr. Pac-Man vs. Ex-Aid & Ghost with Legend Riders, a Pac-Man-like character was introduced as the main villain. In 1982, Milton Bradley released a board game based on Pac-Man. 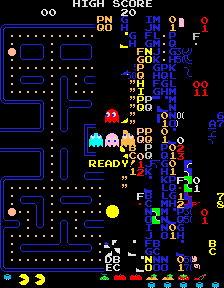 Players move up to four Pac-Man characters (traditional yellow plus red, green, and blue) plus two ghosts as per the throws of a pair of dice. Sticker manufacturer Fleer included rub-off game cards with their Pac-Man stickers. The card packages contain a Pac-Man style maze with all points along the path hidden with opaque coverings. From the starting position, the player moves around the maze while scratching off the coverings to score points. Pac-Man is a playable character in Super Smash Bros. for Nintendo 3DS and Wii U. The 3DS version also has a stage based on the original arcade game, called Pac-Maze. A Pac-Man Amiibo figurine was also released by Nintendo on May 29, 2015. Pac-Man later returned as a playable character in Super Smash Bros. Ultimate. Pac-Man is one of the few games to have been consistently published for over three decades, having been remade on numerous platforms, and spawning many sequels. Pac-Man has been included in Namco's long-running Namco Museum compilations as well as Microsoft Return of Arcade. Downloads of the game have been made available on game services such as Xbox Live Arcade, GameTap, and Virtual Console. Namco has released mobile versions of Pac-Man for BREW, Java, and iOS, as well as Palm PDAs and Windows Mobile-based devices. Pac-Man has numerous sequels and spin-offs, only one of which was designed by original designer Toru Iwatani. Some of the follow-ups were not developed by Namco either, including the most significant, Midway's Ms. Pac-Man, released in the United States in 1981. Originally called Crazy Otto, this unauthorized hack of Pac-Man was created by General Computer Corporation and sold to Midway without Namco's permission. 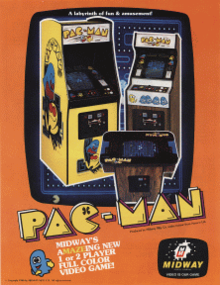 Bally-Midway released several other unauthorized spin-offs, such as Pac-Man Plus, Jr. Pac-Man, Baby Pac-Man, and Professor Pac-Man, resulting in Namco severing business relations with Midway. Coleco's tabletop Mini-Arcade versions of the game yielded 1.5 million units sold in 1982.Nelsonic Industries produced a Pac-Man LCD wristwatch game with a simplified maze also in 1982. Namco has repeatedly re-released the game to arcades. In 2001, Namco released a Ms. Pac-Man/Galaga "Class of 1981 Reunion Edition" cabinet with Pac-Man available for play as a hidden game. To commemorate Pac-Man's 25th anniversary in 2005, Namco released a revision that officially featured all three games. On June 5, 2007, the first Pac-Man World Championship was held in New York City, which brought together ten competitors from eight countries to play the new Pac-Man Championship Edition developed by Toru Iwatani. Its sequel was released November 2010. Namco Networks sold a downloadable Windows PC version of Pac-Man in 2009 which also includes an "Enhanced" mode which replaces all of the original sprites with the sprites from Pac-Man Championship Edition. Namco Networks made a downloadable bundle which includes their PC version of Pac-Man and their port of Dig Dug called Namco All-Stars: Pac-Man and Dig Dug. In 2010, Namco Bandai announced the release of the game on Windows Phone 7 as an Xbox Live game. For the weekend of May 21–23, 2010, Google changed the logo on its homepage to a playable version of the game in recognition of the 30th anniversary of the game's release. The Google Doodle version of Pac-Man was estimated to have been played by over 1 billion people worldwide in 2010. Google later allowed access to the game through a separate web page. In April 2011, Soap Creative published World's Biggest Pac-Man working together with Microsoft and Namco-Bandai to celebrate Pac-Man's 30th anniversary. It is a multiplayer browser-based game with user-created, interlocking mazes. In 2016, an in-app version of Pac-Man was introduced in Facebook Messenger. This allows users to play the game against their friends while talking over Facebook. ^ Japanese: パックマン, Hepburn: Pakkuman? ^ Date shown in January 1982 article "Midway celebrates Pac-Man". ^ a b Long, Tony (October 10, 2007). "Oct. 10, 1979: Pac-Man Brings Gaming Into Pleistocene Era". Wired. Archived from the original on September 11, 2014. Retrieved October 10, 2007. [Bandai Namco] puts the date at May 22, 1980 and is planning an official 25th anniversary celebration next year. ^ "Game Board Schematic". Midway Pac-Man Parts and Operating Manual (PDF). Chicago, Illinois: Midway Games. December 1980. Archived (PDF) from the original on September 23, 2015. Retrieved July 20, 2009. ^ "Pacman Game". Archived from the original on January 21, 2013. Retrieved November 13, 2012. ^ "What is Pacman?". Pacman.com. Namco. Archived from the original on November 28, 2010. Retrieved November 3, 2015. ^ a b Martijn Müller (June 3, 2010). "Pac-Man wereldrecord beklonken en het hele verhaal" (in Dutch). NG-Gamer. Archived from the original on February 27, 2012. Retrieved November 3, 2015. ^ Mateas, Michael (2003). "Expressive AI: Games and Artificial Intelligence" (PDF). Proceedings of Level Up: Digital Games Research Conference, Utrecht, Netherlands. Archived (PDF) from the original on May 14, 2012. ^ "News Headlines". Cnbc.com. March 3, 2011. Archived from the original on October 15, 2012. Retrieved May 22, 2012. ^ DeMaria, Rusel; Wilson, Johnny L. (December 18, 2003). High Score! : The Illustrated History of Electronic Games (2nd ed.). McGraw-Hill Osborne Media. ISBN 0-07-222428-2. ^ Don Hodges. "Pac-Man's Split-screen level analyzed and fixed". Archived from the original on May 2, 2008. Retrieved April 29, 2008. ^ Dwyer, James; Dwyer, Brendan (2014). Cult Fiction. Paused Books. p. 14. ISBN 9780992988401. ^ "Pac-Man review at OAFE". Oafe.net. Archived from the original on October 21, 2012. Retrieved November 15, 2012. ^ a b c d Ramsey, David. "The Perfect Man". Oxford American. Archived from the original on February 29, 2008. Retrieved November 13, 2012. ^ "Pac-Man at the Twin Galaxies Official Scoreboard". Twin Galaxies. Archived from the original on July 26, 2008. Retrieved December 28, 2015. ^ "Twin Galaxies – Pac-Man (Arcade) – Points [Factory Speed]". Retrieved January 2, 2019. ^ "Pac-Man [Fastest Completion [Perfect Game]] ARCADE – 03:28:49.00 – David W Race". August 4, 2015. Retrieved January 5, 2016. ^ Race, David (May 30, 2013). Perfect Pac-Man: May 22, 2013 – 3hrs 28min 49sec (2 of 2). David Race. Archived from the original on January 2, 2016. Retrieved January 5, 2016 – via YouTube. ^ Walton, Mark (January 30, 2017). "Namco founder and "Father of Pac-Man" has died". Ars Technica. Archived from the original on January 30, 2017. Retrieved January 30, 2017. ^ a b Sobel, Jonathan (January 30, 2017). "Masaya Nakamura, Whose Company Created Pac-Man, Dies at 91". New York Times. Retrieved January 30, 2017. ^ "Top 25 Smartest Moves in Gaming". Gamespy.com. Archived from the original on February 18, 2009. Retrieved July 26, 2010. ^ Kohler, Chris (2005). Power-Up: How Japanese Video Games Gave the World an Extra Life. Brady Games. ISBN 0-7440-0424-1. ^ "Daijisen Dictionary entry for ぱくぱく (paku-paku), in Japanese". Archived from the original on December 23, 2015. Retrieved January 27, 2007. ^ a b Green, Chris (June 17, 2002). "Pac-Man". Salon.com. Archived from the original on December 25, 2005. Retrieved February 12, 2006. ^ a b Lammers, Susan M. (1986). Programmers at Work: Interviews. New York: Microsoft Press. p. 266. ISBN 0-914845-71-3. Archived from the original on May 26, 2010. ^ Morris, Chris (March 3, 2011). "Five Things You Never Knew About Pac-Man". Archived from the original on December 25, 2016. Retrieved December 30, 2016. ^ "The Collection: Selected Works from Applied Design; Pac-Man". MoMA. Retrieved March 4, 2013. ^ a b Kohler, Chris (May 21, 2010). "Q&A: Pac-Man Creator Reflects on 30 Years of Dot-Eating". Wired. Archived from the original on July 22, 2010. Retrieved July 15, 2010. ^ a b Kent, Steve. Ultimate History of Video Games, p.142. "Before Namco showed Pac-Man to Midway, one change was made to the game. Pac-Man was originally named Puck-Man, a reference to the puck-like shape of the main character. Nakamura worried about American vandals changing the "P" to an "F." To prevent any such occurrence, he changed the name of the game." ^ Brian Ashcraft. "This Guy Has a Rare Arcade Cabinet. Is It Real?". Kotaku. Archived from the original on May 20, 2013. ^ Goldberg, Marty (January 31, 2002). "Pac-Man: The Phenomenon: Part 1". Arcadegaming.us. Archived from the original on October 16, 2007. Retrieved July 31, 2006. ^ Bowen, Kevin (2001). "Game of the Week: Defender". ClassicGaming.com. Archived from the original on August 26, 2006. Retrieved August 17, 2006. ^ "Atari Spectacularly Fails to Do the Math". Next Generation. No. 26. Imagine Media. February 1997. p. 47. ^ Smith, Keith (January 23, 2014). "The Golden Age Arcade Historian: Video Game Mythbusters – Was Rally-X the Hit of the 1980 AMOA?". The Golden Age Arcade Historian. Archived from the original on July 23, 2015. Retrieved April 21, 2017. ^ "Men's wear, Volume 185". Men's wear. Fairchild Publications. 185. 1982. Retrieved February 28, 2012. ^ "Pac-Man – The Dot Eaters". The Dot Eaters. Archived from the original on October 13, 2014. Retrieved August 17, 2006. ^ a b Mark J. P. Wolf (2008). The video game explosion: a history from PONG to PlayStation and beyond. ABC-CLIO. p. 73. ISBN 0-313-33868-X. Archived from the original on April 18, 2016. Retrieved April 10, 2011. It would go on to become arguably the most famous video game of all time, with the arcade game alone taking in more than a billion dollars. One study estimated that it had been played more than 10 billion times during the twentieth century. ^ Bill Loguidice & Matt Barton (2009). Vintage games: an insider look at the history of Grand Theft Auto, Super Mario, and the most influential games of all time. Focal Press. p. 181. ISBN 0-240-81146-1. Archived from the original on May 14, 2013. Retrieved April 23, 2011. The machines were well worth the investment; in total they raked in over a billion dollars worth of quarters in the first year alone. ^ "Electronic and Computer Games: The History of an Interactive Medium". Screen. 29 (2): 52–73 . 1988. doi:10.1093/screen/29.2.52. Archived from the original on August 17, 2011. Retrieved January 25, 2012. Revenue from the game Pac-Man alone was estimated to exceed that from the cinema box-office success Star Wars. ^ Kevin "Fragmaster" Bowen (2001). "Game of the Week: Pac-Man". GameSpy. Archived from the original on October 1, 2011. Retrieved April 9, 2011. ^ a b Kao, John J. (1989). Entrepreneurship, creativity & organization: text, cases & readings. Englewood Cliffs, NJ: Prentice Hall. p. 45. ISBN 0-13-283011-6. Archived from the original on April 18, 2016. Retrieved February 12, 2012. Estimates counted 7 billion coins that by 1982 had been inserted into some 400,000 Pac Man machines worldwide, equal to one game of Pac Man for every person on earth. US domestic revenues from games and licensing of the Pac Man image for T-shirts, pop songs, to wastepaper baskets, etc. exceeded $1 billion. ^ Leonard Herman; Jer Horwitz; Steve Kent; Skyler Miller (2002). "The History of Video Games" (PDF). GameSpot. p. 7. Archived from the original (PDF) on April 25, 2012. Retrieved March 14, 2012. ^ Chris Morris (May 10, 2005). "Pac Man turns 25: A pizza dinner yields a cultural phenomenon – and millions of dollars in quarters. He also loved to eat a lot of pellets". CNN. Archived from the original on May 15, 2011. Retrieved April 23, 2011. In the late 1990s, Twin Galaxies, which tracks video game world record scores, visited used game auctions and counted how many times the average Pac Man machine had been played. Based on those findings and the total number of machines that were manufactured, the organization said it believed the game had been played more than 10 billion times in the 20th century. ^ Steve L. Kent (2001). The ultimate history of video games: from Pong to Pokémon and beyond : the story behind the craze that touched our lives and changed the world. Prima. p. 143. ISBN 0-7615-3643-4. Archived from the original on April 18, 2016. Retrieved May 1, 2011. Despite the success of his game, Iwatani never received much attention. Rumors emerged that the unknown creator of Pac-Man had left the industry when he received only a $3500 bonus for creating the highest-grossing video game of all time. ^ "Top 10 Highest-Grossing Arcade Games of All Time". USgamer. January 1, 2016. Archived from the original on January 11, 2016. Retrieved January 3, 2016. ^ Ciraolo, Michael (October – November 1985). "Top Software: A List of Favorites". II Computing: 51. Archived from the original on March 13, 2016. Retrieved January 28, 2015. ^ "Pac Man 'greatest video game'". BBC News. November 13, 2001. Archived from the original on December 18, 2006. Retrieved March 13, 2012. ^ Aaron Matteson. "Five Things We Learned From Pac-Man". joystickdivision.com. Archived from the original on June 16, 2016. Retrieved January 16, 2012. "This cutscene furthers the plot by depicting a comically large Pac-Man". ^ a b "The Essential 50 Part 10 -- Pac-Man from 1UP.com". 1Up.com. Retrieved November 4, 2015. ^ Wilson, Jeffrey L. (June 11, 2010). "The 10 Most Influential Video Games of All Time". PC Magazine. 1. Pac-Man (1980). Archived from the original on April 11, 2012. Retrieved April 19, 2012. ^ "Playing With Power: Great Ideas That Have Changed Gaming have from 1UP.com". 1Up.com. Retrieved November 4, 2015. ^ a b Consalvo, Mia (2016). Atari to Zelda: Japan's Videogames in Global Contexts. MIT Press. pp. 193–4. ISBN 0262034395. ^ a b "Gaming's most important evolutions". GamesRadar+. October 8, 2010. Archived from the original on November 7, 2013. Retrieved November 4, 2015. ^ "Space Invaders Part II". Arcade History. ^ "Ghost Hunter". Atari Mania. ^ Bailey, Kat (March 9, 2012). "These games inspired Cliff Bleszinski, John Romero, Will Wright, and Sid Meier". Joystiq. Archived from the original on February 2, 2017. Retrieved April 2, 2012. ^ "Game developer". 2 & 5. Miller Freeman. 1995: 62. Archived from the original on November 22, 2016. Retrieved June 6, 2011. If you made it to the secret Pac-Man level in Castle Wolfenstein, you know what I mean (Pac-Man never would have made it as a three-dimensional game). Though it may be less of a visual feast, two dimensions have a well-established place as an electronic gaming format. ^ "Creating a World of Clones". Philadelphia Inquirer. October 9, 1983. p. 16. ^ Thompson, Adam (Fall 1983). "The King of Video Games is a Woman". Creative Computing Video and Arcade Games. 1 (2): 65. Archived from the original on July 6, 2009. ^ Ratcliff, Matthew (August 1988). "Classic Cartridges II". Antic. 7 (4): 24. Archived from the original on May 24, 2010. ^ a b c Buchanan, Levi (August 26, 2008). "Top 10 Best-Selling Atari 2600 Games". IGN. Archived from the original on July 26, 2011. Retrieved July 15, 2009. ^ a b "Pac-Man Fever". Time Magazine. April 5, 1982. Archived from the original on January 22, 2011. Retrieved October 15, 2009. Columbia Records' Pac-Man Fever ... was No. 9 on the Billboard Hot 100 last week. ^ "The A-Maze-ing World of Gobble Games". Electronic Games. 1 (3): 62–63 . May 1982. Archived from the original on May 12, 2012. Retrieved February 3, 2012. ^ Ellis, David (2004). "The Atari VCS (2000)". Official Price Guide to Classic Video Games. Random House. pp. 98–99. ISBN 0-375-72038-3. ^ Buchanan, Levi (November 26, 2008). "Top 10 Videogame Turkeys". IGN. Archived from the original on October 3, 2009. Retrieved July 15, 2009. ^ a b Edwards, Richard A. (July 1982). "Capsule Reviews". The Space Gamer. Steve Jackson Games (53): 34–35. ^ "About Pac-Manhattan". Pac-Manhattan. 2004. Archived from the original on May 8, 2009. Retrieved July 3, 2009. ^ "Roomba Pac-Man Web Site". Archived from the original on November 9, 2009. Retrieved October 10, 2009. ^ Lau, Dominic. "Pacman in Vancouver". SFU Computing Science. Archived from the original on May 30, 2009. Retrieved July 3, 2009. ^ "Origins of the 'Pac-Man' Defense". The New York Times. January 23, 1988. Archived from the original on February 14, 2012. Retrieved November 20, 2010. ^ Brunell, Evan (May 22, 2010). "Popular Video Game Pac-Man Celebrates 30th Anniversary". New England Sports Network. Archived from the original on July 22, 2010. Retrieved April 11, 2012. ^ "Mario & Pac-Man Showed Up In The Rio 2016 Olympics Closing Ceremony". August 22, 2016. Archived from the original on February 5, 2017. Retrieved December 30, 2016. ^ "The Pac-Page (including database of Pac-Man merchandise and TV show reference)". GameSpy. Archived from the original on April 16, 2009. Retrieved May 7, 2011. ^ White, Cindy. (June 17, 2010) "E3 2010: Pac-Man Back on TV?" Archived June 21, 2010, at the Wayback Machine. IGN.com. Retrieved July 7, 2010. ^ Morris, Chris. (June 17, 2010) "Pac-Man chomps at 3D TV Archived June 25, 2010, at the Wayback Machine. Variety.com. Retrieved July 7, 2010. ^ "Popular Computing". McGraw-Hill. 1982. Archived from the original on January 22, 2011. Retrieved August 14, 2010. Pac-Man Fever went gold almost instantly with 1 million records sold. ^ Turow, Joseph (2008). Media Today: An Introduction to Mass Communication (3rd ed.). Taylor & Francis. p. 554. ISBN 0-415-96058-4. Archived from the original on November 22, 2016. Retrieved January 29, 2012. ^ RIAA Gold & Platinum Searchable Database – Pac-Man Fever Archived September 4, 2015, at the Wayback Machine. RIAA.com. Retrieved November 1, 2009. ^ Grosinger, Matt (February 16, 2017). "Weird Al Talks His Previously Unreleased Song "Pac-Man", Which You Can Finally Hear!". Nerdist Industries. Archived from the original on February 21, 2017. Retrieved February 20, 2017. ^ Liptak, Andrew (February 18, 2017). "Listen to a previously unreleased Weird Al Beatles parody, Pac-Man". The Verge. Vox Media. Archived from the original on February 19, 2017. Retrieved February 20, 2017. ^ "Crystal Sky, Namco & Gaga are game again". Crystalsky.com. Retrieved August 11, 2008. ^ Jaafar, Ali (May 19, 2008) "Crystal Sky signs $200 million deal". Variety.com. Retrieved September 4, 2008. ^ "Classic video game characters unite via film 'Pixels'". Philstar. July 23, 2014. Archived from the original on July 23, 2014. Retrieved July 23, 2014. ^ "Guardians of the Galaxy Vol. 2 redeems a gaming icon on screen". Polygon. May 8, 2017. ^ "Shiro Sano Cast as Dr. Pacman in Kamen Rider Heisei Generations". Tokusatsu Network. November 5, 2016. ^ Coopee, Todd. "Pac-Man Turns 35!". ToyTales.ca. Archived from the original on September 4, 2015. ^ "The MB Official Pac-Man Board Game". Archived from the original on November 10, 2015. Retrieved November 4, 2015. ^ "The Pac-Star: Pac-Man Rub-Offs Section Index". Archived from the original on December 22, 2015. Retrieved November 4, 2015. ^ "Pac-Man". Archived from the original on October 21, 2014. ^ Parish, Jeremy (2004). "The Essential 50: Part 10 – Pac Man". 1UP.com. Retrieved July 31, 2006. ^ "Ms. Pac-Man". Killer List of Videogames. Retrieved July 31, 2006. ^ "Mini-Arcades 'Go Gold'". Electronic Games. 1 (9): 13. November 1982. Archived from the original on August 13, 2012. Retrieved February 5, 2012. ^ "Coleco Mini-Arcades Go Gold" (PDF). Arcade Express. 1 (1): 4. August 15, 1982. Archived (PDF) from the original on November 8, 2012. Retrieved February 3, 2012. ^ "The Official Midway's Pac-Man Game Watch Instruction Manual" (PDF) (booklet). Nelsonic Industries. Archived (PDF) from the original on September 24, 2015. Retrieved November 3, 2015. ^ Schiesel, Seth (June 6, 2007). "Run, Gobble, Gobble, Run: Vying for Pac-Man Acclaim". The New York Times. Archived from the original on June 29, 2011. Retrieved May 20, 2010. ^ "A quick look at some of the new WP7 games from Namco". BestWP7Games. November 9, 2010. Archived from the original on November 12, 2010. ^ "Google gets Pac-Man fever". cnet. May 21, 2010. Archived from the original on October 27, 2010. ^ "Pac-Man". Google. Archived from the original on August 29, 2012. Retrieved November 3, 2015. ^ Ki Mae Huessner. "World's Biggest Pac-Man Is Web Sensation". ABC News Internet Ventures. Archived from the original on April 15, 2014. Retrieved April 13, 2013. Cite error: A list-defined reference named "upi" is not used in the content (see the help page). Cite error: A list-defined reference named "wired" is not used in the content (see the help page). Cite error: A list-defined reference named "gamespotsyn" is not used in the content (see the help page). Cite error: A list-defined reference named "video game explosion" is not used in the content (see the help page). Cite error: A list-defined reference named "gamerevolution" is not used in the content (see the help page). Trueman, Doug (November 10, 1999). "The History of Pac-Man". GameSpot. Archived from the original on June 26, 2009. Comprehensive coverage on the history of the entire series up through 1999. Morris, Chris (May 10, 2005). "Pac Man Turns 25". CNN Money. Hirschfeld, Tom. How to Master the Video Games, Bantam Books, 1981. ISBN 0-553-20164-6 Strategy guide for a variety of arcade games including Pac-Man. Includes drawings of some of the common patterns.